The Finfoots are medium-sized, mostly aquatic birds that occur naturally in the tropical regions of Central and South America; Western, Central and Southern Africa; and Asia. They mostly inhabit thickly vegetated margins of rivers, lakes and swamps. Although they do not migrate, they do disperse in order to form new colonies in preferred habitats. All members of this group have brightly colored, lobed toes for which this group has been named. 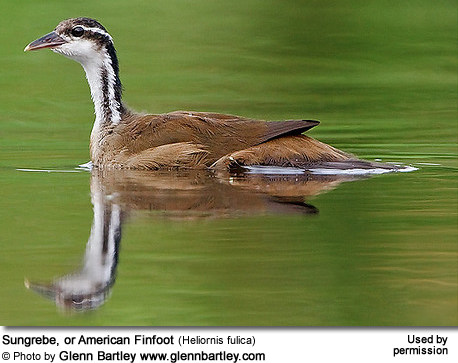 African Finfoot (Podica senegalensis) Found in tropical Africa by streams in woodland areas. It inhabits much of sub-Saharan Africa, from Senegal to Western Ethiopia and south through D.R. Congo, Angola, Zimbabwe, Central Mozambique and into Northeastern and Southern South Africa. Masked Finfoot (Heliopais personata) - Distributed from Eastern India down through Southeast Asia - Its numbers are in decline largely due to conversion of their habitats for agricultural and residential uses. It is possible that fewer than 1,000 mature individuals still exist. Sungrebe (Heliornis fulica) - Found in tropical Central and South America. Similar to the Rails, Finfoots have long necks, small heads, slender bodies, broad tails, and long, tapered, sharp, pointed bills. The Masked Finfoot's legs and feet are a brightly colored red, and, unlike grebes, they are capable of walking well and even moving quickly on land. Their green, webbed, lobed feet allow them to be agile and graceful under water. 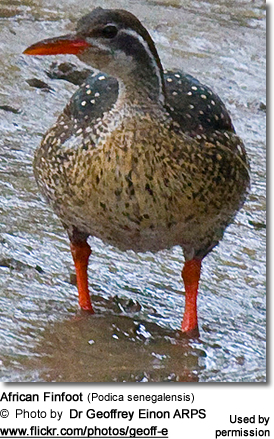 Their puffy, webbed feet and lobed toes give them their name. The plumage varies among the three species, but they are all somewhat pale underneath and dark on top. The female is lighter than the male. None of the species is more than 60 cm (24 inches) long. The African Finfoot (Podica senegalensis) is the largest measuring 46–53 cm (18–21 inches) long. The breeding season of all three species begins after the rainy season ends, depending on the climate in each one's habitat. Almost nothing is known of the breeding behavior of the Masked Finfoot. Each of the three species experiences some alteration in its appearance before the breeding behavior begins. 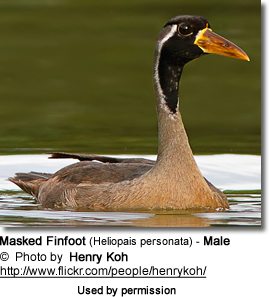 The Masked Finfoot will develop a fleshy growth of knob-shaped tissue above its bill. 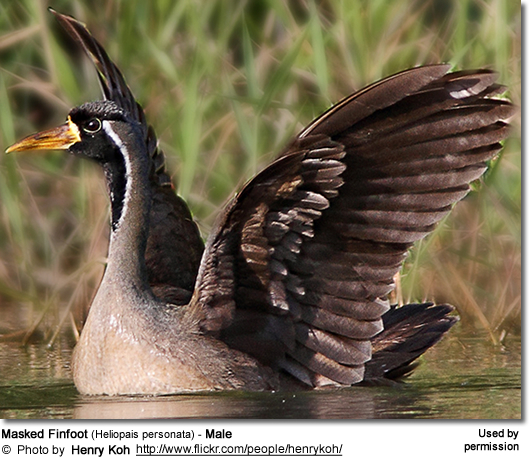 In the male African Finfoot and female Sungrebe there are changes in the color of the plumage. The breeding behavior differs among the three species. The Sungrebe's nest is constructed by both the male and the female, and they also share in the incubation responsibilities. But the female African Finfoot will incubate the eggs by herself. However, their nests are similar—somewhat messy, untidy bowls of sticks, twigs, and reeds which hang from vegetation or fallen trees suspended above the water. The Finfoot is a monogamous species. Two to five eggs are laid and incubated for three weeks solely by the female. The male possesses a most unusual trait: he has skin pouches under his wings in which he carries the altricial chicks, featherless and helpless, from the nest after they hatch. He will grip them so tightly that he can carry them even while flying. The precocial African Finfoot chicks leave the nest a few days after hatching. Finfoots are highly secretive, and often go unseen. Even experienced ornithologists have difficulty locating them. This makes them a prized sighting for birders and twitchers, who will go to extreme lengths to spot rare birds. The Finfoot is generally viewed alone or in pairs. Since they do not fly well, they stay near shady, calm waterways. They are territorial most of the time and definitely during breeding season. The Finfoot feeds on underwater invertebrates, including both adults and larval mayflies, dragonflies, crustaceans, grasshoppers, crabs, frogs, snails, spiders, shrimps, millipedes, beetles, mollusks, fish, amphibians, and some leaves and seeds. Finfoots are thought to be highly opportunistic; rather than diving for their food, they will forage on the water’s surface near the shore for their prey. Unlike the Grebes, they do very well on land, feeding from overhanging vegetation. Although they possess a wide range of calls, these calls are not heard very often. Finfoots are extremely secretive and rarely seen or heard.